Genetic engineering in animals is quite difficult and is still very new. There are three types of genetic engineering that can be used on animals: Xenografting. cloning, and gene manipulation. Xenografting is the use of human DNA to supplement an animal's or vice versa. Generally speaking, the valves and tissues of animals have been used in humans for example, humans have successfully received pig hearts before. Scientists are now learning why they were able to do that, and it is because the heart of a pig is quite similar to the heart of a human. Now scientist are trying to figure out how to grow human hearts in pigs, that are coded from human DNA. If scientist learn how to accomplish this, than many people who are waiting for organ transplants could be saved quicker and have less risk. Cloning is accomplished by inserting the DNA of one animal into the fetus of the same species, along with a vector that cleans out the DNA already inside the embryo. This means that the baby that will be born is genetically the same as the DNA that was inserted into the embryo. Though sometimes the vector does not eliminate all of the original DNA inside the fetus, or the fetus does not adopt the new DNA. These mistakes lead to miscarriages. Although the embryos that accept the new DNA are more likely to develop mutations, such as infertility/ Cloning is currently only focused on cattle with the goal of reproducing the cows with the best milk or meat. Gene manipulation has so far had little progress, most experiments have had bad results. The only successful study so far is a pig that can produce human insulin that can be used to treat diabetes. Genetic engineering has several applications, these applications on animals are categorized into four groups: companion, wild, farm, and transgenic animals. Companion animals are just as their name says, they are just normally household pets with a twist. For example, scientist extracted the genes of a jellyfish that coded for the fluorescent proteins that make the jellyfish glow in the dark. They then inserted this gene into zebrafish that now glow in the dark (Image to top left). 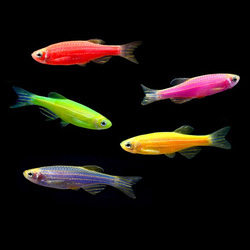 These fish were called "GloFish" and were ban in California, Scientist use techniques of inserting genes, and knocking out genes to create "designer" companion animals. For example, hypoallergenic cats were created by removing the gene that codes for the major cat allergen. Wild animals is a group of animals that are created with genetic engineering. This technology is applied to bring back extinct species or saving endangered species. This application mainly uses cloning. For example, some scientists plan on cloning the extinct woolly mammoth. This technique of cloning could be used to help assist in the reproduction of small populations by retaining the genetic diversity. Farm animals, as mentioned before, are generally engineered for productivity, food quality and disease resistance. Pigs and chickens have been genetically altered to grow at quicker rates than a normal one would. They could also make the animals have better food quality for example, pigs have been altered to have higher levels of omega-3 and goats that have human lysozyme in their milk. Lysozyme is an enzyme that attacks the cell wall of bacteria. Farm animals are also genetically engineered to become disease resistant. For example, cows that are resistant to mad cow disease. One of the most famous GE farm animal is the Enviropig, which is a pig that was genetically altered to produce an enzyme that breaks down phosphorus. This will allow for pig manure with less phosphorus, which is good because if large amounts of phosphorus is leaked into bodies of water it could cause adverse affects. 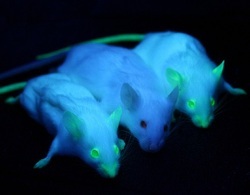 Transgenic animals are animals engineered specifically for scientific testing. For example, they will genetically engineer a mouse to get cancer, which allows scientists to test their cancer fighting medicine.